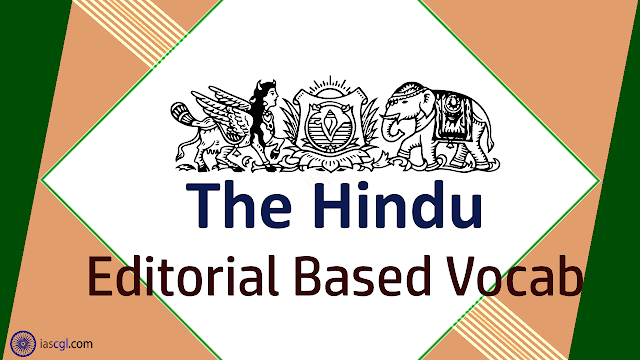 HomeVocabThe Hindu Vocab 06th September 2018 For Competitive Exams. The Hindu Vocab 06th September 2018 For Competitive Exams. Vocabulary from The Hindu Editorial 06th September 2018 for Staff Selection Commission(SSC) Combined Graduate Level, Combined Higher Secondary Level, Bank PO, Clerk and other state Government Examination. The advisory from the Union Information and Broadcasting Ministry to the media saying they “may” refrain from using the term ‘Dalit’ while referring to members of Scheduled Castes is unnecessary, intrusive and issued with little application of the mind. On the face of it, this has been done in compliance with a direction from the Nagpur Bench of the Bombay High Court. But a reading of the court’s June 6 order shows it only wanted the Centre “to consider the question of issuing such direction to the media and take a suitable decision upon it”. The court did not go into the merits of using the term. After it was brought to its notice that the Union Ministry of Social Justice and Empowerment had issued a directive to use only the term ‘Scheduled Castes’ in all official matters, the court merely noted that since media institutions were not a party before it, the I&B Ministry could consider the question of issuing a similar direction to the media. The I&B Ministry’s advisory is confusing as it uses the words “for all official transactions, matters”, though the media’s references to the community are usually beyond official contexts. The advisory must be withdrawn as there is no reason to tell the media how to do their job, even if it is couched in the form of gratuitous advice. Of course, the debate over the appropriateness of using the term ‘Dalit’ to refer to members of the Scheduled Castes is far from new. A decade ago, the National Commission for Scheduled Castes disfavoured the use of ‘Dalit’, which it felt was unconstitutional. This is because belonging to a ‘Scheduled Caste’ is a legal status conferred on members of castes named in a list notified by the President under Article 341 of the Constitution. Therefore, arguably, ‘Scheduled Caste’ is the appropriate way to refer to this class of people in official communications and documents. However, it is inexplicable to oppose the use of the term ‘Dalit’ in the media and in non-official contexts — a nomenclature chosen and used by the community itself. Doing so lends itself to the charge that there is an attempt to deny the powerful and emotive meaning of the word Dalit. The term has evolved over a period of time and has come to symbolise different things in different contexts — self-respect, assertion, solidarity and opposition to caste oppression. In the past, Dalits were referred to as ‘untouchables’, but the official term during British rule was ‘depressed classes’. Mahatma Gandhi sought to remove the stigma of ‘pollution’ by using the term ‘Harijans’, or ‘children of god’. In course of time, the community rejected this appellation as patronising and sanctimonious. It was only some decades ago that they began to refer to themselves as Dalits. ‘Dalit’ literally means ‘downtrodden’ or ‘broken’, but it is a word pregnant with meaning, reflecting the struggle of a community to reassert its identity and lay claim to the rights that were denied to them for centuries. Refrain: बचना - a repeated line or number of lines in a poem or song, typically at the end of each verse. Intrusive: दखल - causing disruption or annoyance through being unwelcome or uninvited. Couched: (किसी ख़ास अंदाज़ में)कहना - express (something) in language of a specified style. Gratuitous: अहेतुक - uncalled for; lacking good reason; unwarranted. Inexplicable: अकथनीय -unable to be explained or accounted for. Stigma: कलंक -a mark of disgrace associated with a particular circumstance, quality, or person. Downtrodden: पददलित - oppressed or treated badly by people in power. Reassert: साबित करना -assert again.